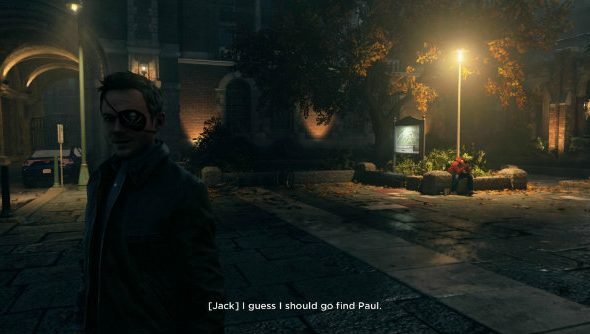 Following Alan Wake wearing an eyepatch in pirated versions of that game – along with loading screen tooltips telling you to buy the game to support the developers – Remedy have implemented similar for Quantum Break, but it’s accidentally branding some legitimate customers. Instead of resorting to piracy, play through our list of free PC games. It’s all a bit of fun. I mean,Jack Joyce sporting a snazzy eyepatch isn’t exactly the most nefarious anti-piracy method in the world. But then, I think I’d still be annoyed if Quantum Break branded me as a pirate after paying £50 for the time-bending third-person shooter on the Windows Store. Redditor disastorm discovered that simply logging out of the Windows Store before launching the game would trigger the facial accessory, which is a bit pants really. What would have made me forgive them is if they’d recorded an alternate version of all the live-action bits with actor Shawn Ashmore sporting the eyepatch. Now that would have been excellent, and probably very expensive. The game’s FAQ addresses the issue ‘Jack looks like a pirate’ saying: “DRM might’ve accidentally triggered. Make sure you’ve logged into your Microsoft account before starting the game.” Cheers for that. Why not check out our Quantum Break PC port review, since you’re here.